White nationalist Richard Spencer spoke to media members in his office in Alexandria, Va., on Monday. 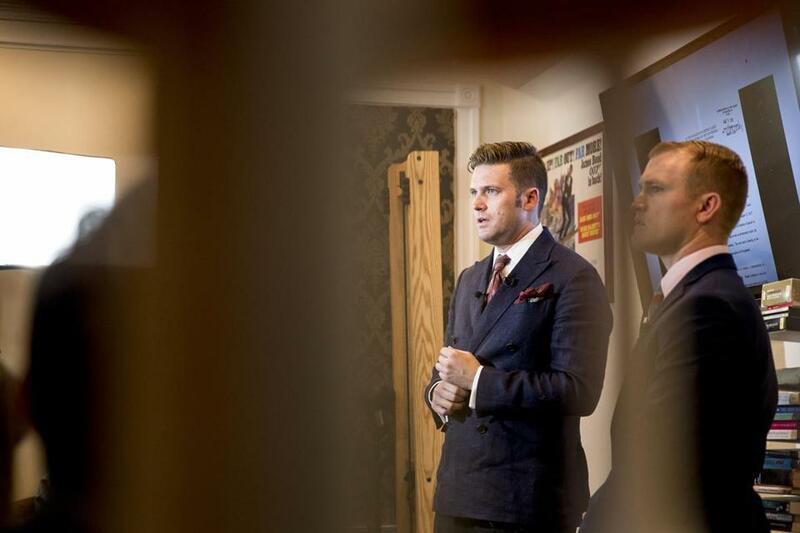 Spencer, self-described creator of the term “alt-right,” said he would speak at Texas A&M University and the University of Florida in September. WASHINGTON — Ambiguity. Euphemisms. Dog whistles. Richard Spencer, white nationalist, on President Trump’s latest remarks about the violence in Charlottesville, Va. Even in his stronger statement Monday, Trump denounced the Ku Klux Klan along with neo-Nazis and “other hate groups,” which he did not define. Combined with the fact that it took him days to address the criticism, experts said, this is the type of ambiguity that the extremist groups rely upon. Astead W Herndon can be reached at astead.herndon@globe.com. Follow him on Twitter @AsteadWH.